If you’re like most adults, you’d like straighter teeth — but when you consider your social and professional life, you feel like wearing conventional metal braces isn’t really an option. Invisalign is a clear braces treatment option that allows you to enjoy straighter, more beautiful teeth without having to wear metal brackets and braces for two or more years. Sounds great, right? It is — but Invisalign also usually costs more than traditional braces. It may not be as pricey as you think, though. With special Invisalign offers from our team, most patients can still comfortably fit clear braces into their budgets. The total cost of your Invisalign treatment from start to finish will depend on a few factors, including the complexity of your case and how well you comply with the treatment. The average Invisalign treatment can cost $5,000 or more — but the price of yours will vary based on the complexity of your case and how quickly it can be completed. 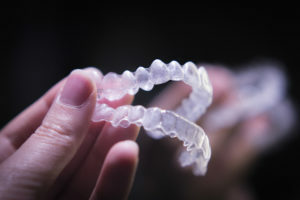 Your dentist will give you a better idea of what to expect after examining your bite alignment during an Invisalign consultation. Wear aligners for 20 to 22 hours each day, removing them only to eat, drink, practice oral hygiene, or for limited important occasions. Do not expose the aligners to heat, like hot water or beverages. Doing so can cause them to warp. Be careful to store your aligners in their special case while you eat or drink — wrapping them in a napkin too often results in accidentally tossing them in the trash..
Visit your dentist as recommended for routine check-ups throughout treatment. Adhering to these instructions will ensure you proceed through your treatment without any (costly) delays. We want to help all of our patients comfortably afford the treatments they need. And right now, our team is pleased to be offering an exciting Invisalign special! You can get Invisalign for as little as $199 per month with 3rd party financing (subject to approval). We invite you to request an appointment with our team to learn more about how this special works. While it can be tempting to make decisions based on who offers the best deal for your wallet, remember that the wisest choice may not always be the cheapest one. When you are dealing with something as important as your oral health, you want to make sure you are choosing an experienced dentist who will take the time to make sure your bite is aligned properly. Fortunately, we offer the affordability and expertise your smile deserves. We can’t wait to help you enjoy a smile that is as healthy and functional as it is beautiful. Dr. Alan Sasson is Boston’s adult orthodontic expert, leading the only practice in Boston to offer 6 different orthodontic solutions specifically for adults. To learn more about Invisalign or any of their other options in braces, you are invited to contact the office at 617-739-1017. Comments Off on How Much Does Invisalign Cost?